STRANGER STRINGS: Phosphor Bronze vs 80/20 Acoustic Guitar Strings - Which Is Best For Me? The very first stringed instruments, known as lyres, were used starting more than 3,000 years ago in Mesopotamia. Indian instruments have been unearthed from 500BC on having over 7 to 21 strings. Today though, even after literally thousands of years of refinement and evolution, stringed instruments use strings that are still made from very few materials. What were the first acoustic guitar steel strings made of? 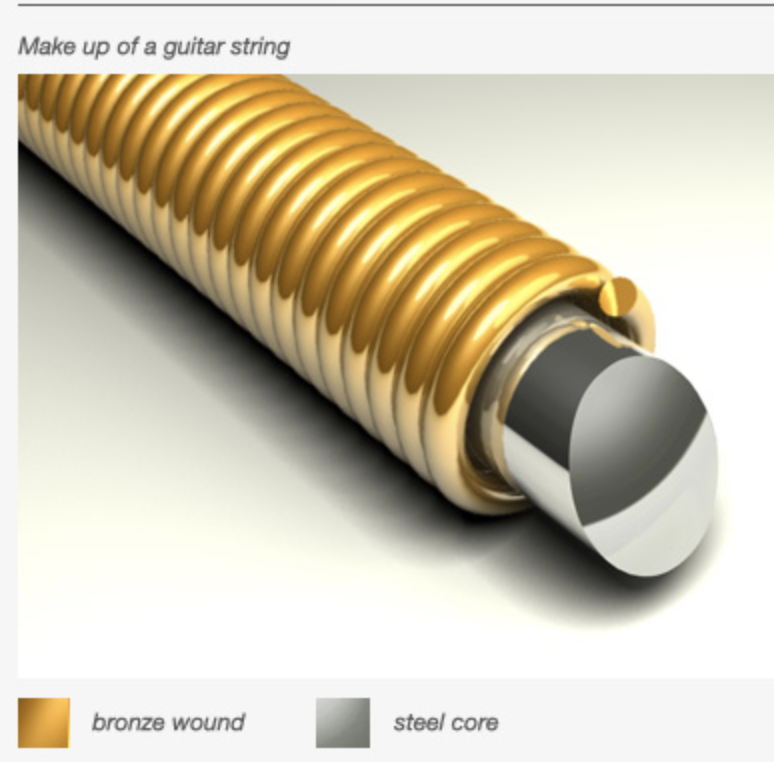 The first steel strings for acoustic guitars were made of 80/20 bronze wrap on steel wire. Sometimes known as ‘brass,’ an 80/20 mix of copper and zinc alloy (respectively) was originally selected by John D’Addario and John D’Angelico back in the 1930s. This bright, yet bass-heavy sound was much loved but came with some clearly evident failings: the copper windings were easily corroded causing the strings to age and quickly lose their tone. The addition of zinc to the bronze slowed the corrosion slightly, but clearly an alternative was needed. Enter the D’Addario company in 1974 with a new string they named phosphor bronze - designed specifically to slow the aging and corrosion of the 80/20 legacy strings. These new strings had a mix of 92% copper, 8% tin and only 0.2% phosphor (the introduction of phosphor serves to delay the alloy from tarnishing as quickly). The longer lasting tone and life span of these strings allowed them to gain popularity rapidly, and as a result, phosphor bronze strings make up the majority of acoustic guitar string sales nowadays. In order to keep the guitar string attached to the bridge of a guitar, a loop or ball end is used. Typically, ball ends are then fastened with lock twists, which are tightly wound to prevent slippage. Guitar strings can be wound in four different variations - roundwound, halfwound, flatwound, and hexwound. The round, half, and flat wound strings all utilize a round core with different winding wires to give them their shape and characteristics. Hexwound strings are typically used with bass guitars and use hexagonal core with round winding wire to give bassists better finger control. The outer materials for the wire wrapped around the core music wire consist of a relatively small range of metals. In the case of bronze wound strings, the bronze wiring is wrapped around a steel core to help create their bright and warm tones. String makers do not make the base wire from which strings are manufactured. Instead, they buy it from specialty wire mills. Most string makers buy their core wire from the Mapes String Company in the U.S. or from Roslau in Germany. String core wire is known as ‘music wire’ and the materials used for plain strings and/or the cores of wound strings are made from a type of spring-tempered high carbon steel called Swedish Steel. Most ‘music wire’ is tin-plated to minimize rust but in recent years, increasingly high tech additives and improvements (hex core, etc.) in the manufacturing process have led to improvements in tone, stability and accuracy. 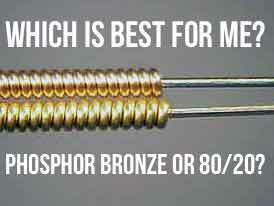 What Are The Tonal Differences Between 80/20 Bronze and Phosphor Bronze Strings? 80/20 bronze (brass) strings are going to offer you a brighter more bell-like tone than phosphor bronze strings will, especially initially. Enthusiasts that love acoustic sounds on records on the sixties and seventies will love these strings - bright yet bassy with a lowered midrange. These strings fare well when put on dreadnought instruments that manufacturers such as Martin, Gibson and Taylor make. Phosphor bronze strings offer you a darker, warmer tone with diminished pick attack and a longer string life. What you’ll notice is that once you’ve played them for a few hours, they’ll have about eighty percent of the brightness and attack of a new set of 80/20 strings. Smaller body and parlor sized guitars benefit from the warmer tones from these strings. Which Strings Should I Get? There are literally millions of guitarists in the world today. Every single one has a different style, a different set of ears and different musical tastes and backgrounds. Our best advice is to give both string types a try on your guitar and see which one fits your tastes the best.